Flinders Ridge, just a short drive from Bighorn, offers 3 prime mountains for snowmobiling. 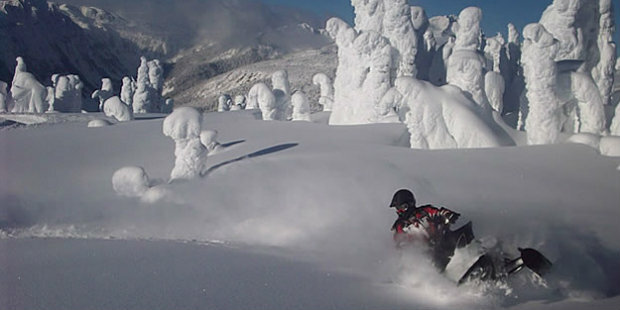 Whether you are an experienced sledder that wants to free ride through the deep powder snow, or a beginner looking for a guided excursion, Revelstoke has it all. Staff at Bighorn can even arrange a snowmobile excursion to a private cabin for a BBQ, night time rides and hot spring visits. Experience husky sledding through the snowy forest trails in Revelstoke. Meet your hardworking but well-loved dogs and set off an a scenic ride, taking things as fast or slow as you like. This is a memorable way to enjoy the beautiful mountain vistas and adventurous types can try mushing the dogs! Get a birds eye view of the stunning Selkirk Mountains, with the Columbia River and Revelstoke town nestled in the valley floor. Take a tandem paragliding flight with a qualified instructor and soar thousands of feet above this winter wonderland. Bighorn’s spa facilities include an indoor current pool, huge outdoor hot tub, sauna, gym and treatment rooms. Our experienced therapists offer a range of treatments from aromatherapy and hot stone massage to body wraps and facials. With yoga instruction and personal training also on offer, a full program of health and wellbeing can be tailored to your needs. The Turtle Creek Tube Park at RMR offers fun and thrills for all the family. Whizz down the specially designed slope in an inflatable snow tube – a bit like toboganing but with a comfier ride! US Vogue recently shared its top picks for the best winter spa destinations. Bighorn, “a superindulgent, sprawling eight-suite lodge” won praise for the “views of the Columbia Valley from the terrace hot tub, on-site helipad, gourmet fare and private screening room”. With a “bounty of body wraps, facials and aromatherapy massages, it is easy to forget you are steps away from some of Canada’s best lift, cat, heli and backcountry skiing“. Other spa facilities include a indoor current pool, sauna, gym and 2 treatment rooms. Private yoga instruction, stretching and personal training is also available. The private chef can create healthy yet delicious menus and can happily cater for any dietary restrictions. Plus, the whole lodge is rented exclusively for your party so total privacy and dedicated service is guaranteed. Bighorn: the ultimate winter health retreat.